It's stylish and fun, but will it save you money? All the models in the SodaStream line-up do the same single thing - turn tap water into fizzy water. The Play’s point of difference is its stylish, minimalist design. We take a look at how it works. Once you’ve installed the carbonating cylinder, which is a little fiddly, you’re good to go. You fill the 1L bottle with cold water, insert the neck of the bottle into the SodaStream and snap it into place – there’s no twisting the bottle into place like with some models. Then you press down on the “carbonating block” for 1-2 seconds for lightly fizzed water. You can press a second time for “medium fizz” and a third time for “high fizz”. After each burst, allow the carbonating block to return to its starting position then tilt and remove the bottle. At this point you can flavour the water. There are loads of SodaStream-branded syrups, which are about $10 for a 500ml bottle that’ll flavour 12L of fizzy water. Or you can flavour with your own homemade syrups or syrups and cordials from other brands. The Play ($139.99) comes with only one carbonating bottle but you can buy extras – they’re about $20 for a two-pack. It comes with a carbonating cylinder that can lightly fizz up to 30 litres of water. If you like your water super sparkly you’ll empty the cylinder faster: we made only 8-10L of super-sparkling water (using three bursts for each bottle) before the cylinder ran out. The good news is the Play comes with a free upgrade to a 60L cylinder. You take the empty 30L cylinder (and upgrade voucher) to any SodaStream retailer and swap it for a 60L cylinder and pay for the gas only – about $24. If you want to stick with the 30 litre cylinder, a refilled cylinder costs about $12. Note, you don’t get the same cylinder refilled – the retailer swaps your empty cylinder for a full one and charges you for the price of the gas. The empty cylinders get sent back for refilling. You can buy extra cylinders if you want spares. The 30L size costs $40 and the 60L size costs $60. Probably not. 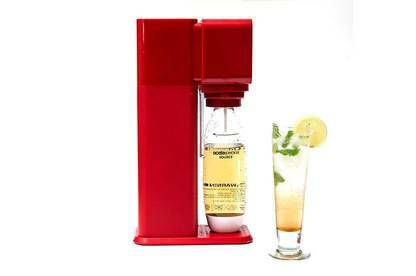 SodaStream-branded flavour syrups cost about $10 and will make up to 12L of fizzy drink. Once you include the cost of gas you’re paying around $2 a litre if you’re using the maximum amount of fizz (three bursts). And that’s without taking the purchase price for the machine into account. But it is convenient - you can turn tap water into fizzy water whenever you need it. It’s perfect for impromptu cocktail parties and for creating interesting non-alcoholic drinks. The SodaStream Play does just what it says it will – it turns tap water into fizzy water. It might not save you money but it’s fun and convenient. Make your own juice with one of our recommended models. Find out which blenders are best.